6319: Aikin Lambert Pet display card: very rare original display, 15.2 cm high, with 6 out of 12 pens still present; pens are miniature ringtop eyedropper-fillers in black hard rubber, with red or light green casein ends and 14K gold nibs, averaging 6.4 cm long; unused and of excellent quality, they are rather evenly sun-faded, and one of the red tops has two chips on the side facing the card; from a long-closed New York area pen shop, the only example of its kind we have seen. 11110: Carter advertising thermometer: porcelain enamel on iron, 69 cm (27 inches) high, typical losses to enamel and rust spots, has not been restored, thermometer not working, colors bright with no fading or crazing. 12344: Cross Peerless letter scale: brass, originally nickel plated, 15.7 cm high, letter is held in clip to weigh, or a string-tied package can be suspended by the hook. Marked "THE CROSS PEN CO./BOSTON". 8939: Eversharp V-Mail Red Top lead: original WW2-era containers, new old stock, around two dozen pieces of lead in each, various grades and thicknesses, no choice; great display item (read about the V-Mail system here). 8938: Eversharp V-Mail Red Top lead: original WW2-era containers, new old stock, several dozen pieces of lead in each, various grades and thicknesses, no choice; great display item (read about the V-Mail system here). 8937: Eversharp Red Top lead: original 1940s containers, approximately two dozen pieces of lead; various grades and thicknesses, no choice; great display items. 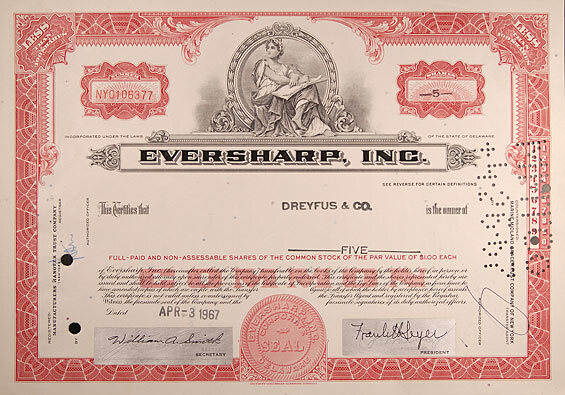 9518: Eversharp stock certificate: several available, 30 x 21 cm, each for various numbers of shares between 5 and 50. 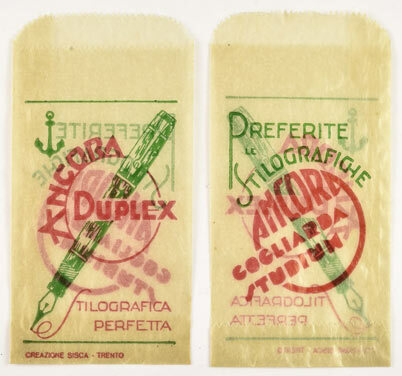 10640: Mabie Todd advertising bookmark: printed cardboard in the form of a pen's nib and section, 15.5 cm long, some slight creasing at the tip; reverse features Swan ink, with a bottle illustrated; British production. 10098: Maycock token: copper "Hard Times" advertising coin, 28mm diameter, issued by the New York firm of Samuel Maycock and John Hague, early makers of mechanical pencils ("EVERPOINTED/PENCIL CASE/MANUFACTURERS"). 12215: Mordan chatelaine pen holder: sterling silver, full London hallmarks, 14 cm long, to carry a full-length eyedropper-filler fountain pen suspended from a woman's belt; a few shallow dings, and some partial seam separation (see details). 10032: Palmer Method pinback button: penmanship award, 2.1 cm diameter, four available, price is per button, specify which desired when ordering. 10130: Palmer Method pinback button: penmanship award, 1.9 cm diameter, for having "SATISFACTORILY MASTERED THE FIRST 25 DRILLS IN THE PALMER METHOD MANUAL"; two available, price is per button -- specify which desired. 10168: Parker 51 Club button: large metal pin back, 3.55 cm in diameter, given to Parker dealers as part of a sales contest promoting the initial release of the Parker 51; rare, and probably even less commonly seen than the sought-after contest award pens. 7651: Parker 75 nib display: five 14K USA production nibs in various stages of completion, to illustrate the process of manufacture; these came to us loose, but could easily be mounted and framed. 13094: Waterman token/gaming counter: off-white, 4 cm in diameter, composition material, some usage chips. 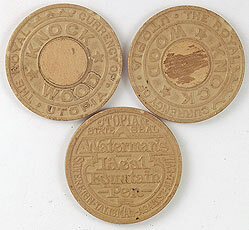 The black version has long been known, as it was mentioned in a 1908 advertisement as a promotional item, a good luck token. Other colors were virtually unknown until the discovery of a few small caches several years ago. It has been suggested that these were made for Waterman president Frank D. Waterman's personal use. We have a few, but this listing is for one token only. 8455: Waterman cigar cutter: blade and metal fittings have patches of pitting, but the imitation ivory celluloid body is clean with only slight rubbing at the top right corner on the Rotary emblem. A promotional item given by company president Frank D. Waterman to his fellow Rotarians -- background history here. 7199: Waterman cigar cutter: celluloid body warped and markings badly worn, blade well-used. Unusual, as most examples marked on one side only. A promotional item given by company president Frank D. Waterman to his fellow Rotarians -- background history here. 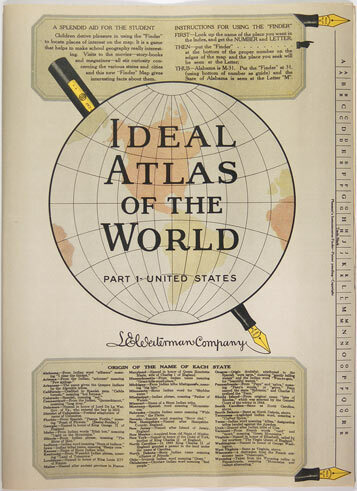 2632: Waterman world atlas: from a series intended for distribution in schools, this covers the United States; consists of one sheet, folded in half, fully opened measures 33 x 48 cm (13 x 19 inches), inside has map of USA with facts and figures about cities and states, copyright date of 1925, outside has strong images of Waterman pens; new old stock.